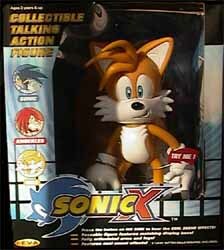 The Sonic X range of 10" talking action figures is pretty impressive. 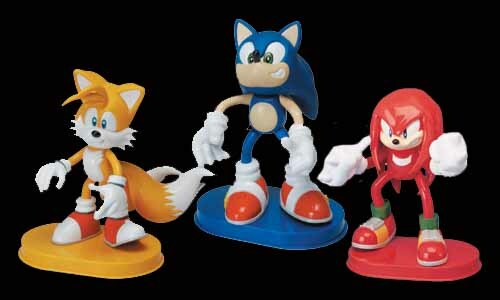 Of the three characters in the range (Sonic, Tails and Knuckles) each comes with a display base to match their main colour (blue, yellow and red respectively). All three have articulated arms and legs and all feature sound bites from the animated TV series. "Come on Sonic! We need to get busy." I couldn't understand why more phrases were not included especially when there are so many that could have been added. This action figure is made from good, strong plastic and is sure to withstand any rough play from younger children. But it is as an ornament, placed on it's base, that this figure is really best suited - and should take pride of place on any Sonic fan's dressing table. Also, Tails's cute, slightly vacant, look is sure to add more of an "Ahhhh!" factor. The RRP (£15) is incredibly cheap when you consider what you get. For £45 you could buy all three, and that's not bad at all. It's just a shame that more wasn't made out of the sound.